December 17, 2014 (the first night of Hanukkah): Rabbi Shmuel Fuerst, founder of the Chesed Fund of Lincolnwood, IL, received a Special Event award from the Samuel S. and A. Irma Cohon Memorial Foundation. Presenting the award was Jonathan Cohon, their grandson, in his office on the first night of Hanukkah (photo below). Rabbi Fuerst administers a program that provides help to needy families, adults and children throughout a very wide Chicago area, with total respect and confidentiality. Rabbi Fuerst is also a well known Halachic authority who uses his great knowledge and energy for Jews in many places, recently succeeding in freeing Jewish prisoners from captivity in Iran. The Chesed Fund offers short-term financial support for Jewish families as well as providing a food bank, free home goods and furnishings, and free clothing. 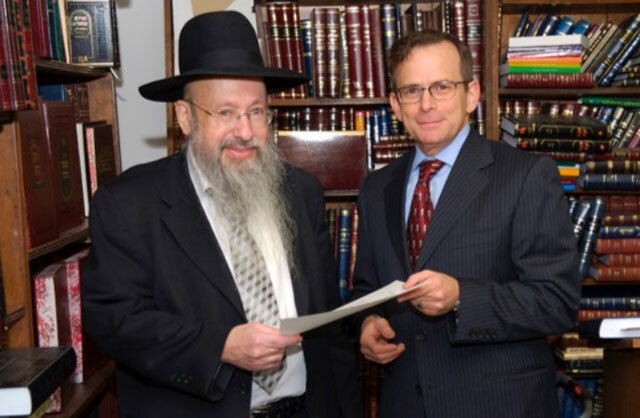 Rabbi Fuerst, founder of the Chesed Fund, provides all of these services in discreet confidence, in addition to his international activities. July 30, 2014: a Shloshim memorial was held in Los Angeles for the three Israeli teenagers murdered by Hamas, marking 30 days since they were buried. An enthusiastic attendance of more than a thousand people filled the Saban Theater. The Cohon Memorial Foundation was a co-sponsor, along with congregations from every Jewish movement, social and educational organizations, the Israel Christian Nexus, the Wiesenthal Center, StandWithUs and many others. A true step toward Unity. June 8, 2014: the Cohon Memorial Foundation dedicated the Arthur Schreiber Jewish Education Building in Cincinnati, Ohio. This will be the home of JEEP (Jewish Education for Every Person) where Rabbi Yakov Karp will operate the first Jewish Recovery center in the Middle West. The entire dedication was a three-hour celebration, but if you have 18 minutes, please join us for the highlights of this unique event as video-recorded by Jonathan Cohon.